Holding the Playstation controller in my hands I laugh to myself out loud as it chirps cheerfully to life. Two expressive square eyes appeared on its touchpad, quickly shifting to a smiling expression. A prompt tells me to push a button and as I do – in truly hilarious clown car like fashion – a hatch opens up on the touchpad and a bunch of robots came flying out onto the table in front of me. As they did, I could feel the big smile across my face – the Sony Morpheus-sized hole in my chest finally had closed. Yesterday at the Neurogaming conference – a small conference dedicated to the intersection of emerging brain machine interfacing technology and games – I stumbled across an opportunity to finally try the Sony Morpheus. At this point, I am super late to the game on this one. The Morpheus had proved to be a white whale of sorts for me, continuously chasing a demo but having random circumstance get in the way every time. Now that I have had a chance to see it, I am glad I had the wait – because it gave me a chance to fully appreciate the Morpheus in comparison to the other HMDs out there (the new consumer Rift notwithstanding). The Morpheus is a very solid HMD – it is not the best out there, that title will likely be held by either HTC or Oculus, but it is good enough for the average consumer. The experienced virtual reality user, however, may notice a few minor warts here and there. First and foremost, the tracking – it is a big improvement over, say the DK2 – but what isn’t at that point? (As an aside, just think about how crazy it is that I can say that with a straight face) The current solution uses a combination of lights and onboard sensors with a Playstation camera that is tracking the movement. The solution, when compared to the Vive’s (because who knows what the Oculus tracking will be) is a downgrade. The range is somewhat limited, as the camera has a 72-degree horizontal FOV with a recommended play area that is two to three meters back from the camera. Stress testing this range I found that the horizontal play space to be acceptable for seated experiences, I had to lean quite far over to break the tracking. Looking in on the dollhouse scene, I was able to get quite close and didn’t feel any jitter at close range – but at one point I hit a wall (figuratively) about a foot from the camera and couldn’t get any closer (which probably is good or I would have knocked the monitor off the table). It may be unfair to compare the tracking on the Morpheus to the Vive, they are different experiences – but when you incorporate a demo with body motion that asks me to stand up that is the comparison that comes to mind. During the London Heist demo, for example, I lost tracking very briefly at the desk when ducking down. It wasn’t bad, but the Vive’s army crawling on the ground level tracking has me spoiled. In terms of input, I was a bit split. Sony’s ‘magic controller’ demo was very impressive. Using a tracking solution for the controller that is similar to that of the headset, they are able to bring the controller to life, tracking its movements in 3D space. 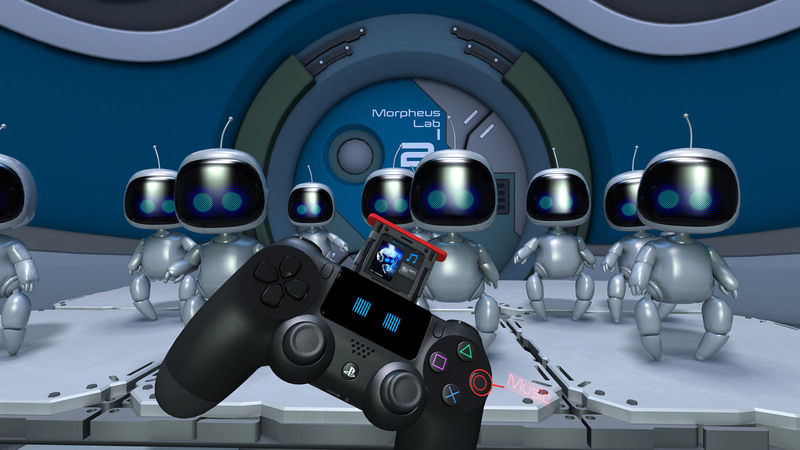 The Playstation controllers have a light on them that is facing the camera. That light has served many purposes in the past (flashing blue and red in GTA V when you’re being pursued for example is brilliant) and is one of my favorite details on the controller – outside of the genius built in speaker – but in this case it is being used to track the controller’s positional data in conjunction with the camera. The controller itself has a number of embedded sensors to track the orientation, meaning that even if the light is occluded (hidden from the camera) the controller’s orientation will still be tracked. This is important because the controller is used in some unconventional ways (like turning itself into a boom box to demo 360 audio, or acting as a cell phone in game) that naturally lead to some occlusion. Stress testing the controller by moving it about quickly in as many ways as I could I found the tracking to be quite good but not always 1:1, there were times when the controller would hang slightly but that was only in more extreme circumstances. Much like I believe we will find out the Oculus Rift has, the Morpheus also has two forms of input – making use of the Playstation Move controllers as well. The Move controller was first released way back in 2010 and the controller itself hasn’t changed much since. The PS4 brought with it an improved camera that increased the controller’s tracking abilities but the truth of the matter is this is a five year old technology – and it lags behind what is out there now. Having tried the best of the best in modern (consumer grade) motion controllers – the Vive’s wands and Sixense’s STEM system – the Move controllers feel a generation behind. The movement translation was satisfactory but not as precise as what I have seen elsewhere. There were moments of lost tracking that caused some imprecise motion. 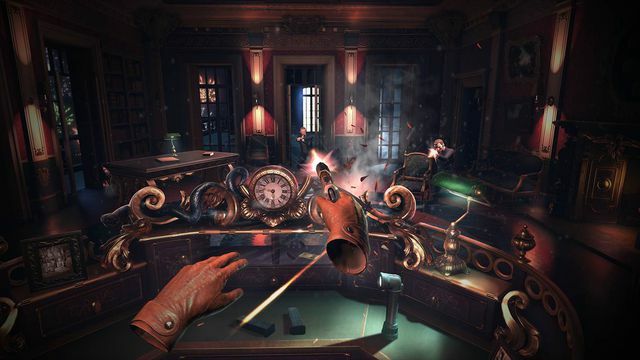 Furthermore, I didn’t feel I had the same level of presence with this controller that I did with the others, for example I wasn’t able to easily toss objects back and forth in my hands like I could on the Vive (although I was able to change the hand my gun was held in during the London Heist demo). I think that some improvements will need to be made to the input technology for it to really hold court with the Vive (and with Oculus, one can assume). The display on the Morpheus is possibly it’s best trait. It boasts an RGB OLED display with 1920 x RGB x 1080 resolution and an awesome 120Hz refresh rate, which was ‘on display’ (even I cringed at that one) during the Magic Controller demo. The display looked crisp and the colors really popped (especially the electric blues of the robots’ eyes). The field of view was a little small, but I’ve also been quite spoiled lately in that respect. One curious thing that I noted when examining the device closely was it had two cords coming out of it that looked an awful lot like dual HDMIs, which would be odd – considering the device has been reported to have a single screen (both the Oculus Rift and Vive will use dual screens). I asked the Sony employee who was demoing if it was dual HDMI’s and he smiled and said, “nope, one HDMI… one something else.” What that something else is, is beyond me because both connections looked the same to me – it’s possible it is just a USB but sure didn’t look like it. It’s interesting because one screen seems limiting at this point – especially as field of view will be increasing thanks to lens advancements by companies like Wearality. Morpheus’ Lenses: The FOV is fine, but it could definitely get better. There was one last thing that I have to admit was a bit of a disappointment – localized multiplayer is probably a thing of the past, at least in the traditional sense. I asked the Sony representatives whether you would be able to play multiplayer with multiple Morphei (Morpheuses?) in the same room and I received a flat no. Apparently it just isn’t possible. They did say however that “asymmetric companion gaming” would be possible, and would likely be something we see. This means one friend could have on the Morpheus and another could be making things happen on an iPad in the scene. He then painted me an image of scaring your friend in a haunted house by triggering the scares yourself. Keep Talking and Nobody Explodes is an excellent example of another kind of localized multiplayer we are likely to see – something that takes advantage of the creative restraints to bring two people into a game. As a whole, the Morpheus experience was great. The headset itself is quite comfortable actually, taking a much different approach than the other competitors on the market. Rather than having it rest on your face like a pair of ski goggles, it hangs in front of it, like a welding mask. It is well counterbalanced and the adjustments are comfortable and easy to do. Ergonomically it may be the best headset on the market, although it did feel slightly heavier than the Crescent Bay or Vive. The Morpheus was well worth the wait, and should be a fine addition to the consumer headset market. With a broad development network, and 20 million plus PS4s in the marketplace (with even more expected to be injected this holiday season) the Morpheus seems like an excellent entry point into consumer grade VR. It also seems like it will have a lot of content initially as well, as the Sony representative teased “lots of demos,” for E3. It isn’t really quite in the same product category, in my mind, as the Oculus Rift or the Vive – which are targeting the massive gaming PC market. Console gamers are a slightly different breed, and a very different market; and the Morpheus is more than good enough to be a massive commercial success.